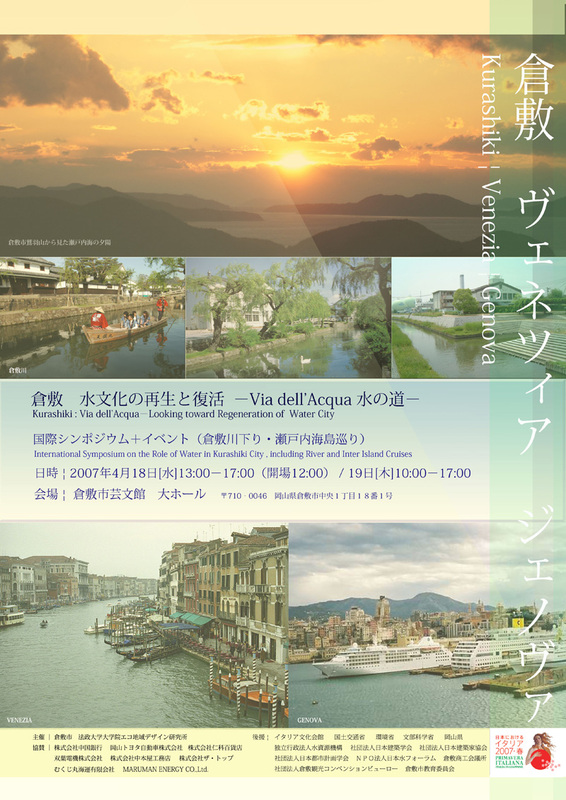 " Regeneration and Renovation of Water Culture--Via dell'acqua"
The International Symposium held on 18-19 Apr., 2007 was jointly held by Kurashiki-city and Laboratory of Regional Design with Ecology, Hosei University. The symposium was the 40-year anniversary of the city, and one of the official programs of Primavera Italiana, 2007. . 1200 and over attended the symposium from all over the country. 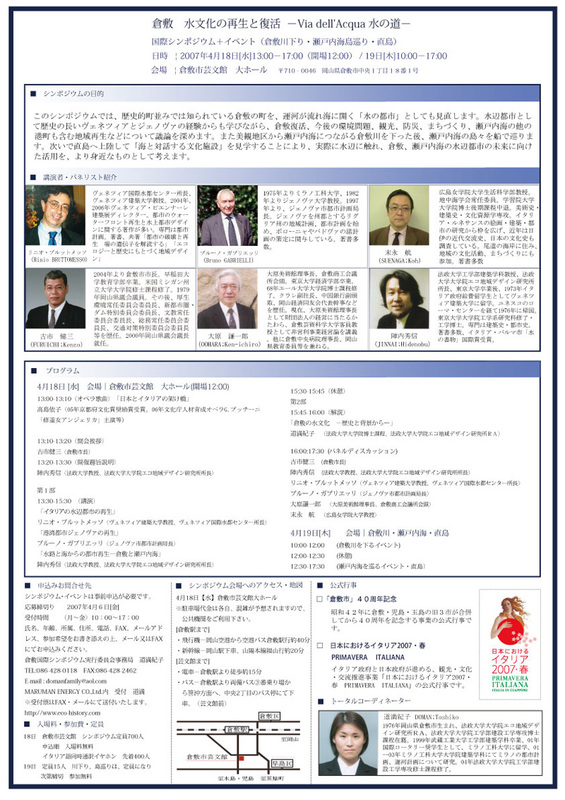 From the viewpoint of regeneration and renovation of water road (via dell'acuqa) in Seto Inland Sea and Mediterranean Sea and water in other cities all over the world, activation of tourism and the city, and the future of Kurashiki as an eco-city were discussed. The themes and lecturers are as follows. Bruno Gabrielli (Director of Urban Planning Department of Genova) : "Renovation of Port Town Genova"; Rinio Bruttomesso (Professor of University Institute of Architecture in Venice and Director of the International Center Cities on Water) : "Renovation of Water Citis in Italy": Hidenobu Jinnai (Director of Laboratory of Regional Design with Ecology, Hosei University): "Urban Renovation from Waterways and Ocean-Kurashiki and Seto Inland Sea", Toshiko Doman (RA of Laboratory of Regional Design with Ecology, Hosei University) : "Water Culture of Kurashiki-From Its History and Background". In panel discussion, the Mayor of Kurashiki-city and Mr. Kenichiro Ohara, Mr. Wataru Suenaga, Prof. Bruno Gabrielli and lecturers above discussed regeneration and renovation of Kurashiki. .
On the second day of the symposium, participants visited former residence of Higashi Ohashi family in front of Ohara Museum of Art in the Kurashiki aesthetic zone, moved to boat pier of the Kurashiki River, and made boat tours from Nitta-bashi in the aesthetic zone to Fujito-bashi for one hour. Then, participants took a river cruiser and made a tour around the islands on Seto Inland Sea and visited Naoshima guided by Benesse Corporation. It will be important to continue researches on water and cities focusing on Kurashiki and Seto Inland Sea in response to citizens' expectations.